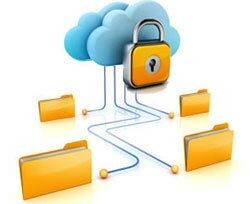 ICS Secure Remote Data Backup service works like regular data backup software, with one important difference. 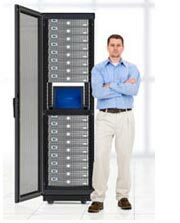 Rather than sending backups to a tape drive or other media attached to the computer, it sends the data securely over the Internet to our backup servers located safely offsite. ICS Secure Remote Data Backup is completely automatic. In fact, you may even forget that it's working. Most businesses put their lives on the line every day without even realizing it. Businesses are depending more and more on the data in their computers and proper backups are becoming increasingly more critical. ICS Remote Data Backup service works like regular data backup software, with one important difference. Rather than sending backups to a tape drive or other media attached to the computer, it sends the data securely over the Internet to our backup servers safely offsite. Our system is completely automatic. In fact, you may even forget that it's working. Most businesses put their lives on the line every day without even realizing it. Businesses are depending more and more on the data in their computers and proper backups are becoming increasingly more critical. 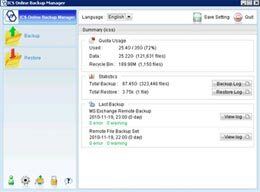 This is the client-side backup application bundled with comprehensive backup features and specialized backup modules for backing up database servers, email servers, file servers and common files. Tired of tape backups? You're not alone. Tape backup has been around for more than 25 years and still has a 50% failure rate. More than 50% of employees back up their data to a misconfigured tape backup system. More than 34% do not test their backups and of those that tested (77%) found their tape backup failed to recover (Storage Magazine). Nearly 50% of tape-based backups (or backup systems) fail to restore correctly (Gartner Group). Tapes wear out, similar to VHS, but you can't tell by visual examination whether they are still good or not. Tape drives are expensive and difficult to replace; new tapes cost $50 to $180 per unit and should be rotated out of service monthly. To be effective, tape backup should be run daily, but it's easy to miss a day (or a week). People often forget to rotate the tapes. Protect all notebooks, desktops and servers. Protect business data against virus attack, hard disk failure as well as fire and flood. Secure and reliable. Total peace of mind.